OLDRIGHTIE: Another Week Passed By. Let us imagine a year on, 2018. Osborne is now the de facto regional Governor of Eurengland, Mrs Krankie his counterpart in Scoteru, all following a swift coup by the EUSSR with the help of The USA and the threat of nuclear submission, if the EUSSR was not fully a Nation of federal states by the 100th anniversary of WW1. The Welsh people hold out with a sudden realisation of what was happening and are now under siege. The signs were all there but it was only when Corbyn offered his full support to topple the Tory Government, in October, 2017 and throw his full socialist treachery behind the EUSSR that the troops across Europe were readied. A further irony in this swift development also gave the excuse to the Berlin poodles in Brussels to swiftly enter Poland and Hungary, in the pretext of protecting the millions of refugees, many now in the EUSSR army battalions, now demanding action from their welcoming political elites. How quickly this collapse of National identity was done. The fear of a Britain standing aloof and above this EUSSR Common Purpose creation, was becoming too dangerous to allow further separation. The brutal suppression of the Catelelan people was seen as so successful it could be now used as a blitzkrieg blueprint, to roll out in Britain. The shock of the sudden invasion, brought to many millions of British people and the revelation of the secret plans, by those wishing to see this occupation succeed, was so severe as to render resistance impossible. The endless delay, prevarication and Hammond engineered, Carney underwritten sabotage was just a small visual indicator of the depth of the treacherous plans afoot. 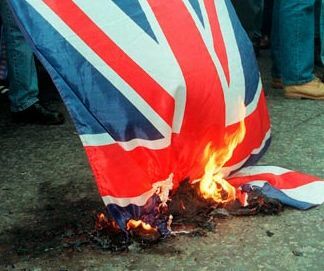 How terrible to now realise that, in such a rapid military occupation, the delays over a Brexit bill of many billions was just a subterfuge to secure every single asset, housing and pension saving jewel to fund further immigrant expansion and pay for the wages demanded by the new military force now enforcing the EUSSR rule of law from Denmark to Greece. As for the immediate consequences. Banks closed and only starvation funds allowed to be accessed and only then by the swearing of allegiance to the EUSSR. Food now only permitted to be made available after quotas sent abroad. Thousands of those who voted or campaigned for Brexit imprisoned. Many high profile figures facing the death penalty for treason to the EUSSR. 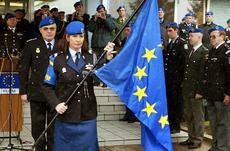 A further irony is the suspension of the European Courts Of Justice and Of Human Rights under martial law. The decree signed by the now Supreme EU Governor, Osborne in order to establish stability for the foreseeable future. For the major towns and cities it is to be replaced by Sharia law and a new, armed police force of Islamic troops is already in place after decades of secret preparation. All churches are now closed. Some to be used as internment centers, others destroyed or where large enough, to be minareted and made Mosques. Practicing Christians over 65 to be interned and forced to work or starve. Some will be used for medical research and their children sequestered for organ transplantation. Though not expected to be necessary studies are underway on the methods used in Europe, by the Nazi occupiers, to cull unwanted opposition. With London renamed Londonistan and the Cotswolds made only available to the new ruling elite, many from the remain cabals, such as that of Mayor Khan and Peter Mandleswiein Mandleson together with the Kinnock dynasty and their ilk, the rapid change of this once proud Island race moves on apace. Just a few remote rural outposts are holding out vainly. Ludlow Castle was such an outpost with many staunch Welsh and English ex soldiers ensconced in those ancient battlements but overwhelmed by the might of the Birmingham Islamic militias, long secretly established and ready to move westwards against the Marches. Herefordshire, with its vast spider's web of country lanes and many powerful village communities remains hanging on. However it's only a matter of time, weeks not months, for their small populations to be overwhelmed and their homes confiscated or destroyed. At least many wives and children were able to flee via Bristol and Cardiff airports to Russia aboard a fleet of quickly provided Aeroflot aircraft. Mrs OR among them and sufficient numbers to set up a UK Government in exile. With the EUSSR now threatening to move Eastwards, beginning with Ukraine, history continues the remarkable repetition of the 1930s and 40s. A German dominated might squaring up to Russia. China already said it will recognise the UK Government in exile and declaring any American presence in the Pacific unwelcome, perhaps all is not lost for democracy post WW3. Though ironic that two communist founded Nations now shine, even if small, a light of hope for the survival of Nationhood, belonging and loyalty to decent cohabitation. A desire for some many years, of Common Purpose, to rule a global society of enormous proportions, believes it's now close to such dominance. Their biggest failing? To re-write a history of lies and ignorance of human nature, to replace the encyclopedia of history and experience. The likely outcome of selfish hubris and giant socialist ego? A nuclear holocaust and a dark, sunless winter on a frozen wasteland of a forsaken planet. A destiny the present global elite more than will have deserved. I couldn't finish reading this - it rings too true.